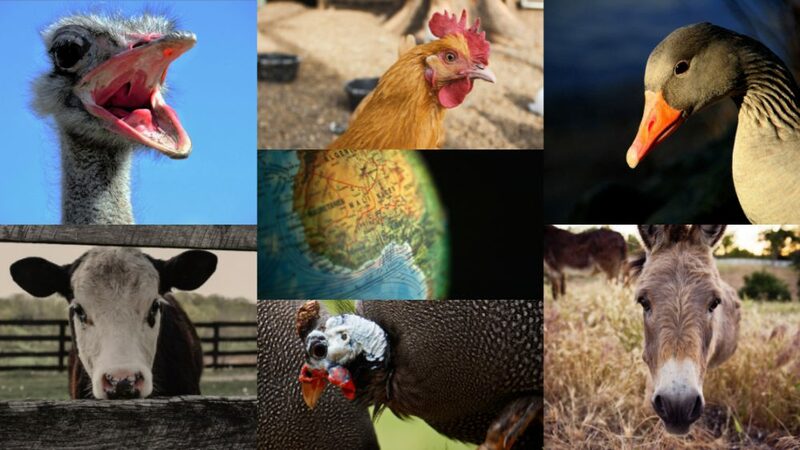 Did you know that all of the world’s continents (besides Antarctica) have at least one species of native animal living on a working Loudoun farm? Today we’re looking at Loudoun farm animals with genetic roots in Africa. Africa is the only continent that stretches from the northern temperate zone to the southern temperate zone, with some of the world’s hottest locations in between. This range of climates helps support domesticated animals of all shapes and sizes. Cattle: Originally domesticated near the border of Asia more than 10,500 years ago, cows have held status, wealth and religious meaning over the years. Chickens: Derived from wild junglefowl in multiple locations around the world, chickens today outnumber humans by nearly three-to-one. Geese: The Eastern U.S. is home to native Canada geese and snow geese, but the first instance of goose domestication was in ancient Africa. Loudoun geese are a popular addition to backyard flocks and farms, including Fields of Athenry Farm, Faith Like A Mustard Seed Farm and Harpers Ferry Family Farm. Guineafowl: Domesticated from helmeted guineafowl, this species of poultry originated in Africa and was in Greece by the fifth century B.C. Loudoun guineafowl are a popular addition to backyard flocks and farms, and are sold at Loudounberry and The Bluemont Store. Donkeys: Donkeys were first domesticated as pack animals in Egypt more than 5,000 years ago, and still work on farms in many countries. Loudoun donkeys can be found at a number of farms, including Donkey Meadows and the Equine Rescue League. Ostriches: This is one of the newest domestications in human innovation, and was only started about 150 years ago in South Africa. Ostriches can be found on several farms in Loudoun County, including Blue Mojo Farm. Do you want to meet these animals? Mark your calendars for the Loudoun Spring Farm Tour, May 18 and 19, 2019. Visitors can enjoy free, self-guided driving tours to participating farms and craft beverage venues during the county-sponsored events.